As I haven't really seen many French girls strolling about with shiny belts around their necks! My dear dear Bella,you are fearless and magnificent. I shall have a good look at Style By Santina. I watched the whole program of Satelite TV , and I was in tears. Chic outfit Hun. Love the choker! What a fantastic idea. I was so excited to catch a glimpse of these stripes(I love, of course)! What a clever DIY job w/ the chocker & Patent leather too? most excellent! 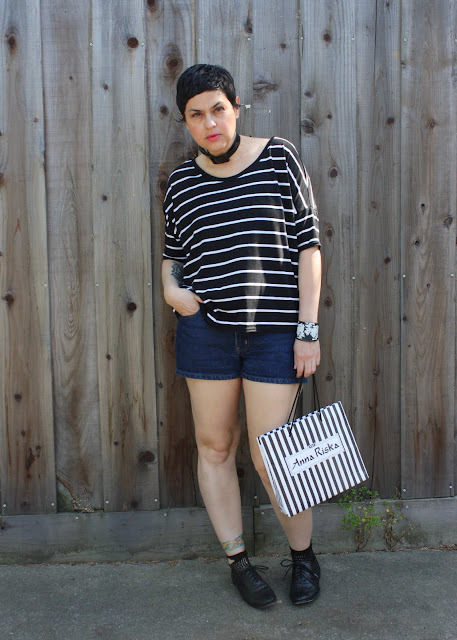 Stripes are always a good thing, and I love the choker you made, you're so clever! Bella, I love this look on you!! It is simple yet so stylish! I also like the look of Santina and I will visit her site!! Love the cuff and how your tattoos add so much character to the outfit. I am beyond flattered, Bella! YOU are such an inspiration in so many ways - from your commitment to your beliefs to your unique unwvavering personal style. You are always true to you, and nothing is more beautiful than that! Thank you so, so much! Now, let's chat about this fabulous outfit because I kinda want it...all of it. Genius DIY with the choker, comfortable yet chic oversized striped top (do I even need to comment?) and those amazing brogues! When we finally meet (you promised, and I'm holding you to it) it will be a striped, short hair explosion of style. CAN'T WAIT! This outfit seems so authentic too you and your style...I love it!! Does that shirt come in cream/white with black stripes? If so, off to Target I go! Hahaha, I loved your comment about parisien girls not wearing shiny belts around their necks. Your uniques is really palpable, this is parisien chic re-invented. I appreciate an individuality. 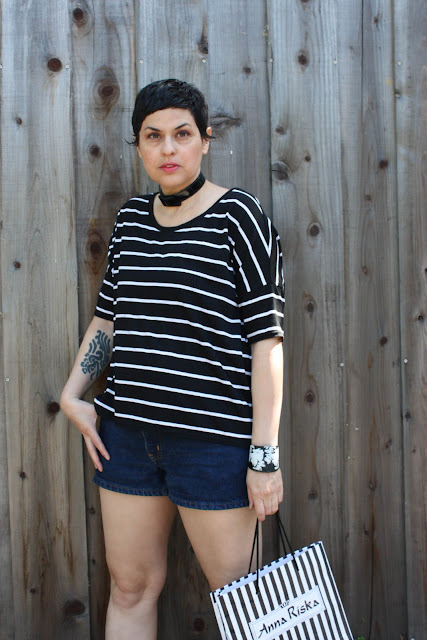 that's a great DIY choker, and i think both you and Santina are rockin' the striped top look. love both blogs. You look so adorable! I love both of your looks. I really like the idea of the leather belt choker! Fabienne of House in the Clouds used one to make a cuff. I am going to copy both of you!! 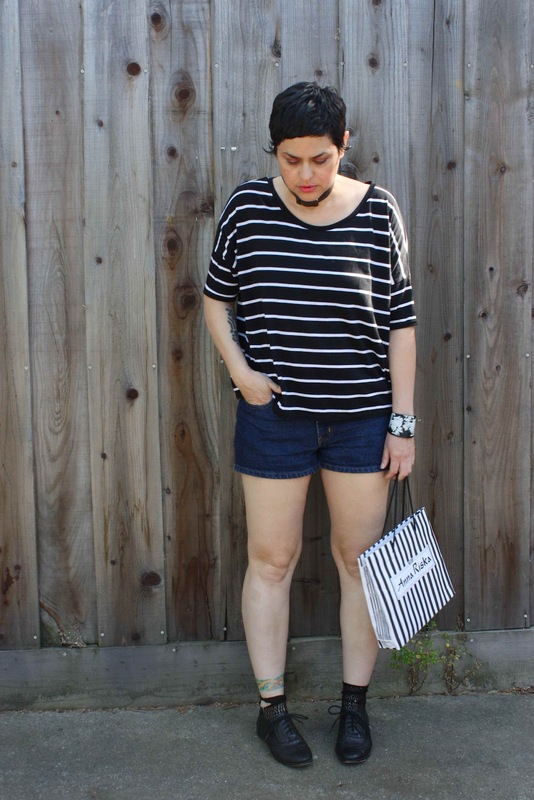 I love me some stripes! You are totally rocking this outfit! I love striped and I love this top on you. I just plain love the top and wish that I also had found it! I like your poses. All I can seem to do is smile in every picture. Every time I try to look thoughtful or serious I end up looking bored or angry. Thanks for introducing me to Santina, I will visit her blog soon! And I hope we get the YSL doc screened in Sac, I have it saved in netflix but that doesn't mean they will ever get it either!! And you look parisian chic, effortlessly cool as always!! STRIPES!! my favorite. you are too cute! I really like Santina, and I don't understand why she doesn't have hoards of followers. She has such great style, and I love her beach photos. You look great, and the necklace you are wearing is really cool. I'm loving the stripes! Both of you put together such a great look. I cannot believe that top is from target, its so awesome! I've got the Second Hand Pledge up on my blog now! And this morning I'm spreading a little blog love around. I am passing an award on to you. I'm not sure where the Luxury Blogger Award originated, but to me living below your means is a luxury because it's nice to have things you love without being stressed over how you're going to pay for them. You can find the rules for passing the award along on my post today, http://thriftygirlvintage.blogspot.com/2011/05/blogger-luxury-award-and-fifteen-frugal.html. Thanks for writing such an inspiring blog! Your hair looks really cool! Really wish I could pull that off. It's getting warmer, so it's time for me to get a haircut soon. I do like the Parisian stripes look. Nice touch with the choker and bangle too! Can I say that I'm a little jealous that you can pretty much wear anything and it looks awesome? Lovin' the stripes on you! Well, I'm certainly not french, but I think I'd run around with a shiny belt around my neck and Americana stripes on! And DAMN, girl. Those legs. Hot stuff. I think you look wonderful in this! The choker I thought would be too juvenile (back when I was a juvenile at least) but I actually really like it here with the open neck. I love how you change it up all the time with stripes, polkadots and florals... you do it well. I have been to Paris 4 times and have seen so many chic and creatively dressed ladies... I think you would fit in for sure! I've had stripes on the brain recently too. No time to come up with a blog post yet, but I was thinking just the other day "how would Bella wear stripes?". And here you are in stripes!